Elegant and durable stainless steel scissors with doubleground edges for silky smooth, precise cutting all the way to the tips. The light serration on one blade grips slippery fabrics and multiple edges. 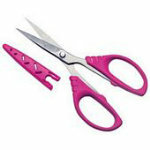 Excellent for detail cutting, quilting, patchwork, cutting in embroidery, applique, and more. Purplepink comfort grips add beauty and style. Safety cap included.